This article was initially published in 2003 in DBAZine.com, which has since been folded. So, you want to set up a secured database infrastructure? You are not alone. With the proliferation of threats from all sources — identity thefts to corporate espionage cases — and with increased legislative pressures designed to protect and serve consumer privacy, security has a taken on a new meaning and purpose. Part of the security infrastructure of an organization falls right into your lap as a DBA, since it’s your responsibility to secure the database servers from malicious entities and curious insiders. What are your options? Firewalls are first to come to mind. Using a firewall to protect a server, and not just a database server, is not a new concept and has been around for a while. However, a firewall may be overkill in some cases. Even if a firewall is desirable, it may still have to be configured and deployed properly. The complexity in administering a firewall, not to mention the cost to acquire one, may be prohibitive. If the threat level can be reduced by proper positioning of existing firewalls, the functionality of additional ones can be created by a tool available free with Oracle Net, Node Validation. In this article, you will learn how to build a rudimentary, but effective, firewall-like setup with just Oracle Net, and nothing else. Figure 1: Protecting departmental database and application servers using multiple firewalls. This scheme works. But notice how many firewalls are required and the complexity that having this number adds to the administration process. What can we do to simplify the setup? How about removing all the firewalls and having one master firewall around the servers, as in Figure 2? Figure 2: One master firewall around all the servers. This method protects the servers from outside attacks; however, it still leaves inside doors open. 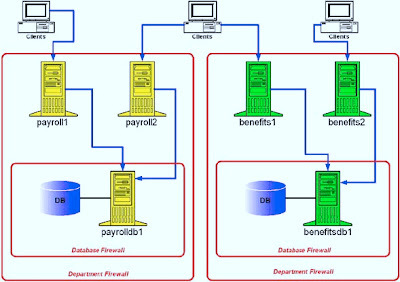 For instance, the application server PAYROLL1 can easily connect to the database server of the Benefits Department BENEFITDB1, which is certainly inappropriate. In some organizations, there could be legal requirements to prevent this type of access. Rather than creating a maze of firewalls as in the case we noted previously, we can take advantage of the SQL*Net Node Validation to create our own firewall. We will do this using only Oracle Net, which is already installed as a part of the database install. The rest of this article will explain in detail how to accomplish this. Our objective is to design a setup as shown in figure 3. In this network, the application servers benefits1 and benefits2 access the database on server benefitsdb1. Similarly, application servers payroll1 and payroll2 access the database on server payrolldb1. Clients should be given free access to the intended machines. Client machines shouldn’t be allowed to access the database on other departments (e.g., benefits1 and benefits2 shouldn’t be able to access the database on payrolldb1). Likewise, application servers payroll1 and payroll2 should not be allowed to access benefitsdb1. 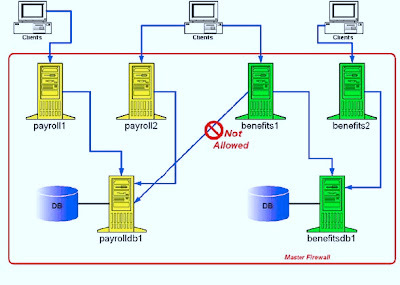 Figure 3: One master firewall and restricting access from non-departmental clients. Note the key difference in requirements here — we are not interested in disallowing any type of access from client machines to servers of another department. Rather, it’s enough to disable access at the Oracle level only. This type of restriction is enforced by the listener. A listener can check the IP address of the client machine and, based on certain rules, decide to allow or deny the request. This can be enabled by a facility called Valid Node Checking, available as a part of Oracle Net installation. Let’s see how this can be done. To set up valid node checking, simply place a set of lines on a specific file on the server. In our example, the following lines are placed in the parameter file on the server payrolldb1, allowing access to servers payroll1 and payroll2. Where this parameter file is located depends on the Oracle version. In Oracle 8i, it’s a file named protocol.ora; in Oracle 9i, it’s called sqlnet.ora. Both these files are located in the directory specified by the environmental variable TNS_ADMIN, which defaults to $ORACLE_HOME/network/admin in UNIX or %ORACLE_HOME%\network\admin in Windows. These parameters are self-explanatory. The first line, tcp.validnode_checking = yes, specifies that the nodes are to be validated before accepting the connection. The second line specifies that only the clients payroll1 and payroll2 are allowed to connect to the listener. The clients are indicated by either IP address (e.g., 192.168.1.1) or the node name as shown above. The list of node names is specified by a single line separated by commas. It is important to have only one line — you shouldn’t break it up. The values take effect only during the startup of the listener. After making the change in protocol.ora (in Oracle 8i) or sqlnet.ora (in Oracle 9i and later), stop and restart the listener. After you’ve done so, if a user, regardless of the authentication in the database or authority level, attempts to connect to the database on benefits1 from the node payroll1, he receives the error as shown below. The error message is not very informative; it does not explicitly state the nature of the error. This error occured, however, because the connection request came from a client that is not listed as accepted. In this case, the listener simply rejected the connection originating from the node benefits1, regardless of the user. Yet the same user trying to connect from node payroll1 would succeed. All clients but those connecting from payroll3 would be able to connect to all nodes. So, in this case, clients benefits1 and benefits2 would be able to connect to payrolldb1 in addition to clients payroll1 and payroll2. Isn’t that counter to what we wanted to achieve? Where can this exclusion be used? In real life cases, networks are subdivided into subnetworks, and they offer adequate protection. In a particular subnet, there may be a greater number of clients needing access than the number being restricted. In such a case, it might be easier to specifically refuse access from a set of named clients, conveniently named in the tcp.excluded_nodes parameter. You can also use of this parameter to refuse access from certain machines that had been used to launch attacks in the past. You can also mix excluded and included nodes, in which case, the invited nodes are given precedence over excluded ones. But there are three very big drawbacks to this approach. 1. There is no way to specify a wild card character in the node list. You must specify a node explicitly by its name or its IP address. 2. All excluded or invited nodes are to be specified in only one line, severely limiting your ability to specify a large number of nodes. 3. Since the validation is based on IP address or client names only and it’s relatively easy to spoof these two key pieces of identification, the system is not inherently secure. For these reasons, mixing excluded and included nodes is not quite suitable for excluding a large list of servers from a network or subnetwork. This method can be used when the list of machines accessing the network is relatively small and the machines are in a subnetwork, behind a firewall. In such a configuration, the risk of external attacks is very slight, and the risk of unauthorized access by spoofing key identification is negligible. Oracle Net also provides another means to develop a rudimentary firewall using a lesser known and even lesser used tool called Connection Manager. This tool is far more flexible in the setup; you can specify wildcards n-node names without restrictions such as the need to have only a single line for naming the nodes. A detailed discussion of Connection Manager with real-life examples can be found in the book Oracle Privacy Security Auditing. Of course, things may not always proceed as smoothly as in the examples we’ve cited so far. One of the common problems you can encounter is that the exclusion may not work even though the files may be present and the parameters seem to be defined properly. By doing this, the trace information to be written to the directory /tmp instead of the default. After setting the parameters as shown above, you should attempt the connection again. There is no need to bounce the listener. The connection attempt will create trace files named similar to svr_0.trc to be written in the proper directory. You should open this file in an editor (parts of the file are shown below). 1. The parameter file /u02/oracle/product/9.2/network/admin/sqlnet.ora was read by the listener. 2. The parameters were loaded successfully. 3. The contents of the parameter were read as they were mentioned. 4. The names of the excluded and invited nodes are displayed. If the information is not as shown here, the problem be caused by the way the parameter file is written; most likely a typographical error such as a missing parenthesis. This type of error should be fixed before proceeding further along the trace file. Note how a parenthesis is left out, indicating a syntax problem. However, this does not affect the connection; the listener simply ignores the error and allows the connection without doing a valid node checking. Upon investigation, we would find the root of the problem in the trace file. The trace file shows the following information. [20-JAN-2004 12:45:14:320] nttcon: NT layer TCP/IP connection has been established. As the line says, the TCP/IP connection has been established. If any other problems exist, the trace file will show enough helpful information for a diagnosis. Node Validation can be used to instruct listeners to accept or reject a connection from a specific client. The parameter file is sqlnet.ora in Oracle 9i and protocol.ora in Oracle8i. The nodes must be explicitly specified by name or by IP Address; no wildcards are supported.